In addition to the Estate’s own nature trail there are numerous nature sites nearby where you can go for a hike. The clean, safe natural environment invites you to exercise and experience nature’s benefits for wellness. Bicycles are available for rent in the summer and snowshoes in the winter, along with various games like Frisbee golf and pétanque. Experience three days in three unique national parks of Middle Finland and stay overnight in Country Estate. The Taulu Estate represents local historical building tradition on it’s best ! The Estate is a cosy base wherefrom you go hiking and paddling to the surrounding national parks and return to relax in this beautiful milieu and sleep well your night in our unique guest rooms. In Taulu Estate full board package you enjoy fine foods and local seasonal tastes, both while hiking in national parks and in Estate. Tours to national parks are guided by professional guides of Pistoretki. On the first day you will arrive to the Taulu Estate and after checking-in you travel towards the Leivonmäki national park. In the family-friendly paths of Leivonmäki national park you can see the many faces of the nature in Central Finland: lakes, ridges, mires, rapids and esker. You will hike the Mäyränkierros Trail (“Badger Trail”), about 6 km and will take a breath, have small snack and enjoy the sceneries. If you want, the route can be extended or shortened to Harjukierros Trail (“Esker Trail”) and getting aquinted to the scenic Joutsiniemi. After the hiking tour you will return to the Estate, where you relax and will enjoy the Estate Supper. After well slept night and the country-style breakfast your trip will be heading to Southern Konnevesi national park. Southern Konnevesi national park is surrounded by lakes in the Heart of Finland. You will paddle through a maze of islands among smooth glaciated rocks and vertical rock walls. In the clear water you will be able to catch a glimpse of the depths that are the domain of the wild lake brown trout. You will paddle from the center of Rautalampi towards the rock painting of Toussulinna cliff and on your tour back you will enjoy a tasty nature lunch at the Sirkkavuori lean-to-shelter. Return to the Taulu Estate for the evening. The day will be finished in a relaxing warmth of Garden Spa, where you can look back at the day’s adventures and enjoy hot tube on the garden terrace. On supper after sauna you will be enjoying local, seasonal tastes. After breakfast and check-out your trip will be heading to Pyhä-Häkki national park. Here in the finest and best preserved old-growth forests of Southern Finland you will see 400-year-old pine trees. Ancient shield bark pines scarred by old forest fires will stop the hasty townsman and -woman to astonish the smallness of a human being. You will hike the Kotajärvi Trail, wherefrom you will take aside to Poika-aho Crown Tenant Farm. During the trail you will hear more about the history of Pyhä-Häkki national park and you can admire these old-growth forests. At Lake Kotajärvi cooking shelter you will enjoy light nature meal. Easy going ground and the hiking tour will take 4-6 hours. After the hiking tour you can start heading to your next stop. During this holiday you will experience the forests and waters of Finland safely. Addition to your visit to national parks you can think back on the adventurous days while enjoying the serenity of the water and peace and quiet of the Finnish nature. Remember to bring good shoes and outdoor clothing. Lake Hautajärvi and Mount Hautavuori rising behind it are fine local sites for nature lovers. The location was named after a depression in the earth at the southern end of the mountain – in Finnish “akonhauta” – a broad, round sink-hole left by the last ice age. Ancient Finns believed that such a sink-hole was the beginning of a rainbow. In the spring Lake Hautajärvi is home to swans as well as common water birds like seagulls and ducks. Year after year, the same swan couple returns to the late in the spring and in the fall we are enchanted by their gosling. The lake is a nature preserve, with hunting prohibited. There are beautiful distant views from the top of Mount Hautavuori. On the other side of mount there is a magnificent formation of boulders that makes you feel tiny in comparison. The formation has a number of caves and the mountain is covered with virgin forest. Lake Lapinjärvi is among Central Finland’s best bird-watching lakes, including common pochards, tufted ducks, Slavonian grebes, Northern Shovelers, garganeys, etc. The lake is an important resting spot for migrating birds with a diverse population of water fowl. In the spring you can find jack snipes, and often Bahian Nighthawks in the summer. Spotted Crake can also be heard singing in the summertime. Lake Lapinjärvi is about 5 kilometres from the Taulu Estate. The Siikajärvi nature trail offers exercise and relaxation for every season, with a tended cross-country skiing trail in the winter. The route passes by both virgin forest and the results of efficiently managed forests. There are two lean-tos for resting. The length of the trail to the turning point is 6.3 km, i.e. its full length is 12.6 km. The trail starts at the Toukola community centre, 5 km from the Taulu Estate. The Haapsuo-Syysniemi nature preserve (surface area 24 km²) in Leivonmäki is one of Central Finland’s most valued nature sites. The area has large areas of virgin swampland, diverse lake and river areas as well as beautiful ridges and forests. The broad, ecologically significant entirety is made up of various smaller areas: the Syysniemi shared forest area in the north, the Haapasuo ombrotrophic raised bog in the south and groups of ridges several kilometres long. Haapasuo is an internationally significant bird and swamp-life preserve. Haapasuo and Syysniemi is home to many species of forests and swamps. Treeless bogs are the territory of cranes and golden plover. Bright pine ridges hum with nightjars. The hollows of old trees are home to flying squirrels and many owls. The shy red-throated diver nest in small ponds and otters patrol the riverbanks. Slowing and calming down, mindfulness. The ability of forests to increase people’s well-being and reduce stress has been well documented. Experience the invigorating and calming effect of Finnish forests by rocking in the cradle of the forest. Metsänkehto is a journey into quiet contemplation that begins with a moment together to prepare for the coming experience. Through conversation, we create a safe atmosphere and we go through how the Metsänkehto experience proceeds. We slow down with a mindfulness exercise through which we leave everyday things behind and prepare for quiet contemplation in the forest. We then go into the silence of the forest with our guide. Participants make themselves comfortable in the hammocks provided for them in the forest and relax while watching the swaying tree tops above them and enjoying the sounds and smells of the forest. The guide is nearby throughout. The time spent in the forest is according to individual experience: from five minutes to half an hour, after which we return to the meeting place. To finish, we gather together and there is a voluntary feedback ring chaired by the guide, where each person can share something of their experience. Available for minimum of 2 persons. Price 75 euros / person. Use clothing that suits the weather. This service must be booked in advance. 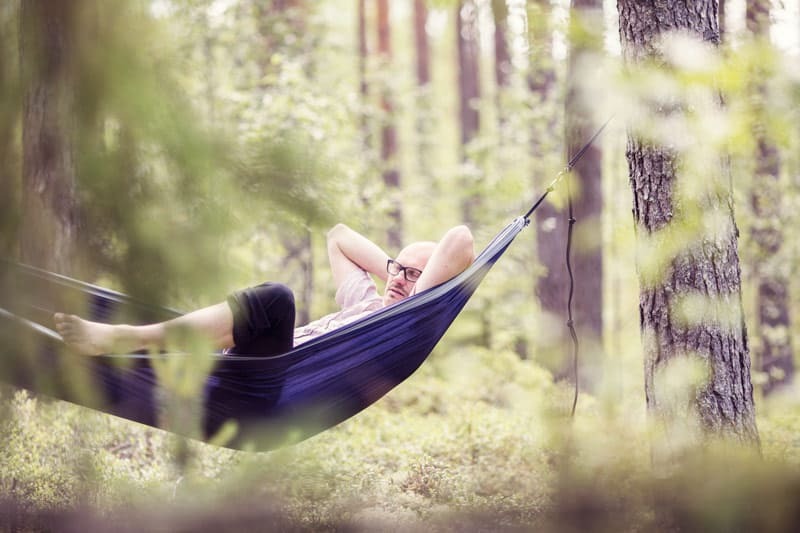 According to research carried out by the Finnish Forest Research Institute (Metla), even relatively short periods spent in forest have an effect on a person’s body and mind. In addition to reducing blood pressure, 20 minutes spent daily in the forest increases feelings of vitality. It has been shown that just seeing forest through the window is enough to raise the spirits. “Just five minutes in the forest has an effect on energy levels,” says Kati Vähäsarja. The essential oils exuded by forests have been studied in Japan and they are thought to have beneficial effects. The same could be thought to be true in Finland. The scents and relaxing sounds of the forest reduce stress, as do seeing forest scenery and experiencing the tastes of the forest. According to project manager Kati Vähäsarja from Metla, just entering a forest is enough to improve mental well-being.